What Google Tasks Triggers and Actions Are Supported? New Completed Task - Triggers when a task is completed in a specific task list. New Task - Triggers when a new task is added. New Task List - Triggers when a new task list is created. Create Task List - Creates a new task list. Update Task - Update an existing task. Find Task - Searches for an incomplete task. To get started with Google Tasks, first click to add a Google Tasks account in your zap. Next, you'll name this Google Tasks account. Note: This name is only for identifying the account inside Zapier, it will not automatically try to add a specific Google Tasks account. 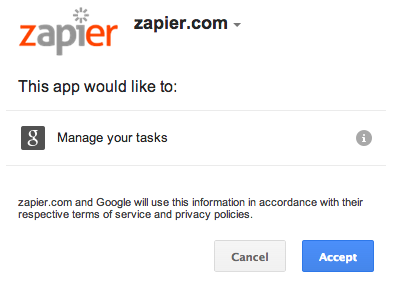 You should then get a pop-up window from Google Tasks asking you to log-in to authorize the connection between that Google Tasks account and Zapier. If you are already logged in the pop up will show right away. After logging in, you'll get sent back to your zap where you now have your Google Tasks account connected! The "new task" trigger requires a specific Google Tasks list. In order to trigger on all Google Tasks you'll need to create a Zap for each Google Tasks list you have. If Google provides a way to grab all tasks we'll implement a trigger that works on all tasks without having to select a specific list.